Biden, accompanied by his wife Jill, eulogized former US Sen. Ernest “Fritz” Hollings, a South Carolina Democrat and longtime friend whom the former vice president credits with helping him get elected to the Senate and with convincing him to remain in the chamber after a tragic car accident claimed the lives of his first wife and 13-month-old daughter in 1972. The role of political eulogist is one that’s grown increasingly familiar to the 76-year-old former vice president, who can personally speak of political titans’ legacies after cultivating close relationships with his fellow lawmakers over a career spanning more than four decades in Washington, DC. Biden’s eulogies have ranged across the political spectrum, from Democrats like former Michigan Rep. John Dingell and former Massachusetts Sen. Ted Kennedy to Republicans like former Arizona Sen. John McCain and Thurmond, a prominent segregationist. 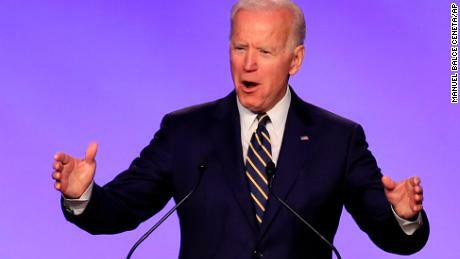 But those types of remembrances also highlight a complicated political dynamic for Biden, whose praise for those across the aisle has irked some Democratic primary voters, and it further emphasizes his decades-long career in the nation’s capital at a time when some in the Democratic Party are pushing for fresh faced and diverse candidates. Biden’s tributes to his longtime colleagues often strike a bipartisan, unifying tone, pressing for a restoration of civility in politics — a tenet that has become central to the Biden brand. Biden’s friends and supporters point to those values and his empathy and ability to comfort others as some of his greatest attributes. Biden’s ability to connect with people in their moments of grief was born in part out of his own experience with tragedy. In 1972, his first wife Neilia and young daughter Naomi were killed in an auto accident, which also injured his two sons, Beau and Hunter. The Biden family experienced loss again in 2015 when Beau, the former attorney general of Delaware, died after a battle with glioblastoma, a disease that also claimed the lives of McCain and Kennedy. That sentiment is shared by Michigan Rep. Debbie Dingell, whose husband and former congressman John Dingell passed away earlier this year and to whom Biden paid tribute in February. Biden’s role as a eulogist extends beyond political heavyweights. Last fall, the former vice president crisscrossed the country, taking a break from a days-long speaking stint in California to travel to Delaware and back to deliver a eulogy for his longtime friend and former staffer Tommy Lewis. Days later, Biden jetted from a speech in Las Vegas to the Boston area for the funeral of his friend and former political consultant John Marttila. In 2012, Biden took a break from the campaign trail to eulogize former senator and Democratic presidential nominee George McGovern in South Dakota. “Several of you said, ‘How could you be here in the middle of a campaign?’ Where I come from you ask, ‘How could you not be here for someone who’s done so much? '” Biden said at a prayer service for McGovern, who was at the top of the Democratic ticket when Biden first ran for Senate in 1972. As for Hollings, the late senator was long aware of Biden’s affection and praise, joking about what his own funeral might look like.